Question: Add feature to allow for deletion of map files? Question: Would you like the easy customization feature added even though you can't change individual variables? The Goliath Script Placer is a Java-based script placer with a focus on versitility. 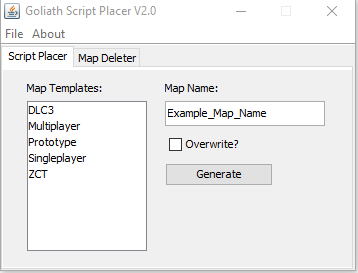 Unlike other script placers, the Goliath Script Placer has the ability to add or remove custom made map templates. To Install: Open and paste the contents of the Goliath Script Placer.zip file into a folder on your desktop. To use: double click on the GoliathScriptPlacer.jar file. This program is licensed under the Creative Commons(CC) BY-NC-ND license, which can be found in the provided ZIP file. By using the Goliath Script Placer, you agree to the license's terms. Seems a bit OTT to have to DL Java and enter a serious of commands to run a script placer. Regardless it works fine. and just save in same directory as jar as a .bat file. Eh, I imagine most people have java installed anyway so I figured it wasn't a big deal. Launching it via a batch file completely slipped my mind. Thanks for reminding me. I'm probably going to do one or two Command Line Interface release before I start working on GUI. I still have actually place the files to the correct directory. I'm not 100% how go about doing do it besides manually specifying a directory. +Generated scripts not place in the World at War directory. If both versions(CD and Steam) the Steam version is what is used. 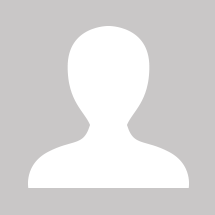 +Files in mod_processing are now deleted after processing is complete. +Template name change from nazi_zombie_tutorial to Goliath_template. Old templates will not work. You can fix this by using the older version of the Goliath script placer to change the file names. +Added .bat file to easily launch the Goliath script placer(Thanks to Scobalula for reminding me about this!). +Increased width of the mod list area to 100 pixels to make room for longer mod template names. +Added tool-tip to overwrite checkbox. +Clicking on the area where you add your map's name should now automatically delete the example map name text. +Fixed bug in which the first mod template was the only mod generated regardless of user selection. (edit)+ Fixed a bug where the user could keep clicking the button while map generation was in progress. The button will now disable and re-enable itself. +Added "developer" checkbox. When clicked, the generated map's folders and files will be placed in the output folder instead of the Steam or CD game directory. This also has a tool-tip for explaining what it does. a bug regarding the output folder getting stuck to output if the developer checkbox was at any point selected during application runtime has now been fixed. Removed script placer limitation regarding the maximum amount of sub-directories. Any and all sub directories should now be deleted. Added poll for a new feature. Redesigning the Goliath Script Placer's GUI + adding map deletion feature. Looks a bit crowded but I'd hate to increase the app's size just for map deletion any more than I have already. -Selected Only(select from the list via shift + click). Added another poll regarding whether people would still like the easy customization feature even though you can't change individual variables in each script. And then there are function calling which would be difficult to implemment correctly(what if it requires other custom scripts, what if the required spot doesn't exist, etc?). So basically, if I did go through with the easy customization feature, it would just be a list of things that -in addtion to the selected mod- would copy over to wherever its directory is and replace the existing file if exists. Still could be useful for custom perk shaders, sounds, modified stock scripts, etc. So, yeah... let me know via the poll. 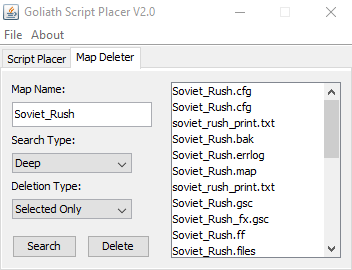 Goliath Script Placer V2.0 Alpha released. -Revamped GUI - now has a menu and tabs to switch between the Script Placer and Map Deleter! -App now properly follows OS theme. -Moved "developer" under "File" dropdown menu. +Script Placer now has the ability to search(but not delete) map files from the user's directory. Ability to delete will come in a future version. Note: Searching for map files will use an entire CPU core(25% of a quad core) or more and will take some time to complete(about 15-30 seconds) as it scans the entire root directory. The ability to do a faster, targeted search via typical map directories(WILL NOT DISPLAY ALL MAP FILES THIS WAY) may be available in a later update. Note 2: having "developer" checked will scan the output folder instead of the user's WaW directory. Edit: Just realised you said you're scanning the entire root directory. May I ask why you would release something as inefficient as this? And why do you not just scan map_source, maps etc.? Or even better, read the contents of relevant csv files? My previous statement still applies, you should probably take some courses to help you further. You should never do I/O at that scale without threading. I figured scanning the entire root directory would be the most compatible with various types of mod_template(s) placing different files in different places. A targeted scan would just go right past some files and never add them to the array list, which is why I want to provide an option to choose the scan type. Scanning via .csv would just add another layer of complexity that I don't see the point in. Really with that way you'd just be opening a dozen or more .csv that may or may not include references to a map's files(children .csvs can have references to their parent map .csv) and *still* be scanning directories anyway as i'm pretty sure JavaXT's getFiles() method still checks each file's name to find the files. +Lots of internal changes - cleanups/separation of script placer and map eraser. +Tab name change from "Map Deleter" to "Map Eraser". +App no longer crashes if no mod_source files exist. +Script placer's button is not clickable if no mod_source files exist. +Fixed tooltips on about JFrame. +"Fast" search is now implemented and gives nearly instantaneous results compared to the deep scan option. +Added thread for script placer. Currently breaks if attempting to place more than one map at a time. any one have a new goliath script placer links ? ?